This is my latest quilt finish–my Christmas Patience Corners Quilt. Last night I put the last of the stitches in the binding. Yes that is the resident quilt inspector perched up there on top of the quilt. I barely got the quilt on the bed and he was up there inspecting it. By the way, the headboard on the bed is new–made by my husband. It is nice to have a proper place for the clock radio, and my books. The new headboard was necessary to keep the pillows from getting pushed between the headboard and the mattress. This is a close up of the quilting–Swirls (using the Circle Lord templates). Before leaving for my Arizona holiday in November, I finished quilting LindaJ’s (http://catsnqlts2.blogspot.ca/2012/12/good-day.html) Patience Corners quilt and had it in the mail back to her. It was a lot of fun quilting Linda’s quilt as I recognized the fabrics in her quilt that had come from my collection. This entry was posted in christmas quilt, patience corners quilt by Norma Hanson. Bookmark the permalink. I thought that looked familiar at the bottom, LOL. THX to your long arming we both have our quilts on the bed! Yeah us! Is the headboard what your hubby had been working on so diligently out in the shop that he declared off limits??? Or you have another surprise waiting next week? Congrats on the finish Norma; it’s a beautiful quilt! And I love your headboard. 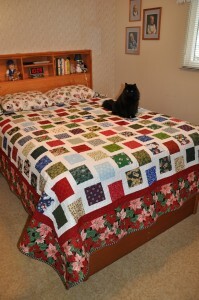 nice new location Norma…love how this quilt turned out!